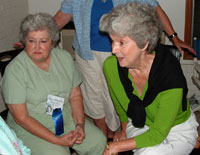 The Coastal Georgia Chapter of The Mississippi University for Women Alumnae Association is currently in the early stages of development. The chapter is being organized from Brunswick, GA but will range from Savannah, GA to Jacksonville, FL depending on alum interest. Three alumnae from the Golden Isles met recently at a "Wretreat" on Jekyll Island. Neely Woods Hunter '95 of Brunswick, GA, Mary Blanche Haney Rice '57 of St. Simons Island, and her sister, Ann Haney Johnson (MSU '62) also of St. Simons Island, met with nearly two dozen alumnae and alumni Wretreaters to enjoy a Seafood Gumbo and Wretreatini dinner. They promised that this would simply be the first of many meetings!